Barclays Center, the home of the Brooklyn Nets, was completed in 2012. On and off the court, the Brooklyn Nets are a franchise with aesthetic appeal, but no real identity. Though their status as one of the worst teams in the NBA doesn’t help their cause, there’s more plaguing the Nets than just their record. While the neighbouring New York Knicks are no powerhouses themselves at the moment, the experience of watching them play at Madison Square Garden is a draw in itself. A Brooklyn game at Barcalys Center is entertaining in its own way, but after the initial polish rubs off, you’re left with a feeling like something is missing. That was my reaction anyways after attending the Nets-Dallas Mavericks game – a treat, I know. It all starts with the exterior, with the arena immediately recognisable from a distance and standing out in what is otherwise a fairly low key area. 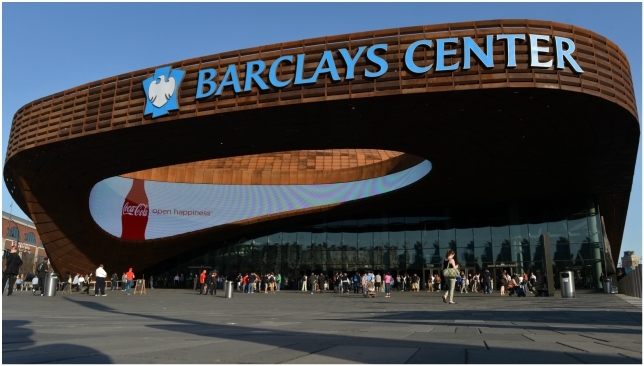 Barclays Center has a unique look and modern finish – which it should considering it was only completed in 2012 – yet its surroundings don’t add much to the atmosphere. Right across the venue is a giant shopping centre, which is so… blah. Madison Square Garden is an unfair comparison for any arena, let alone one lacking in history and tradition like Barclays Center, but the difference between heading to a game in the same vicinity as Times Square and the Empire State Building, and going to one next to a shopping centre can’t be overstated. The same ‘style over substance’ theme carries over to the interior of Barclays Center. Let me just say this to make it clear. The franchise has done an amazing job making everything look great, which is no surprise considering Jay-Z was a a minority owner at the start of their relocation and makeover. 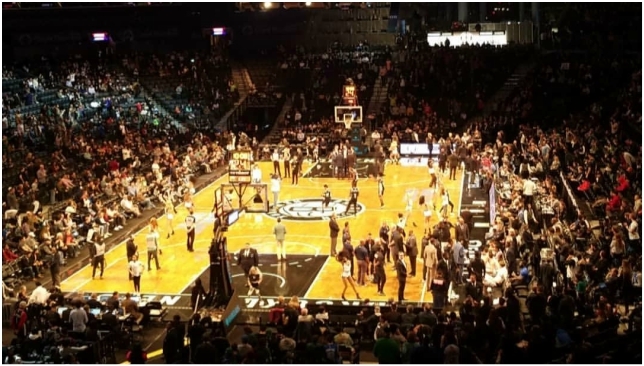 From the herringbone-patterned court to an opening from the arena’s entrance to the stands – which allows fans, at certain angles, to see traffic on the roads outside while watching the game – Barclays Center hits a home run. And the piece de resistance of the whole place is the unique theatre lighting. No other NBA arena has such a dramatic contrast between the lighting on the court and the lighting in the stands, with the Barclays Center putting a spotlight on the floor and having everything surrounding it in the dark. It’s a cool way to take in a game and makes you wish it was more common. There’s also a lot of black. Like, a lot. Of course there would be because it’s one of the team’s primary colours, but while black is almost always stylish, too much of it can be exactly that – too much. The sleekness of Barclays Center comes at the cost of charm and character, which isn’t something Brooklyn is lacking as a borough. The arena and franchise, however, just have this expansion team feel, as if you created them out of thin air in NBA 2K. It’s all relatively new, so you can understand their shortcomings in that aspect. But they don’t do themselves any favour by trying too hard in some areas, such as their excessive use of music in the middle of the game. The product on the court somewhat mirrors everything off it. The Nets actually play a fun and entertaining brand of basketball with good ball movement and plenty of outside shooting, ranking third in the league in passes per game with 326.6, seventh in assist percentage at 60.8, second in both 3-pointers made (12.3) and attempted (35.0), and seventh in pace with 100.9 possessions. What has all that translated to? A 22-48 record, the eighth-worst offensive rating at 103.9 points scored per 100 possessions and the seventh-worst average plus-minus at minus-4.2. If the on-court product is fixed and more talent is drafted and developed, it could just as easily solve the Nets’ identity issues off the court. Something will be needed soon though because the fresh and new feeling won’t last forever. The Knicks hosted the Philadelphia 76ers at Madison Square Garden on Thursday. There’s something about watching a game at Madison Square Garden that just feels unique, in a way which can’t be replicated by any other arena in any other city. One of the great aspects of the NBA is that there’s a culture around each team and the fan experience can vary depending on geography, but that’s especially true of the New York Knicks. I got the chance to witness that firsthand when the Knicks hosted the Philadelphia 76ers on Thursday at the ‘Mecca of basketball’. Speaking of that nickname, some use it to describe New York City as a whole, while others specify it as Madison Square Garden. It’s fair to say right now the city isn’t deserving of the moniker considering the sorry state of their franchise and the drop-off in NBA talent being produced locally. MSG, on the other hand, is definitely deserving. Why? Well, it all starts with location, location, location. The arena is smack dab in the middle of Manhattan, blocks away from Times Square and the Empire State Building. You can’t possibly get a more urban surrounding, even if you reverse engineered it by building an area first and then the city around it. There’s so much life and activity around MSG that when you walk up to it, you feel like you’re going to an event that carries weight. The interior feels just as cool, even if the reminders of history and tradition dispersed throughout don’t resonate with you. It may be lost on someone attending their first NBA game, but the contrast between the lighting on the court and the lighting in the stands is beautiful. While not as dramatic as the theatre-like lighting at Barclay Center, MSG’s version does give it that Broadway touch and adds to the experience. The starry feel wouldn’t be complete without the actual stars, and MSG plays into it by having a ‘Celebrity Row’ tidbit during timeouts where they put a camera on the notable names in attendance. At the Knicks-76ers game, those included actors Ansel Elgort, Timothee Chalamet and Hank Azaria, New Edition member Ronnie DeVoe and former New York Giants star Justin Tuck. The Staples Center in Los Angeles is probably the only other arena that can claim to host a who’s who every home game. In practically every area, MSG hit the mark and proved its reputation is well-earned. The one disappointment I had, however, was not being in a more electric atmosphere. I get it. The Knicks are a lottery team and their best player, Kristaps Porzingis, is out for the season with a torn ACL. There’s not much to get excited about in a game in March. That said, I expected a little better from Knicks fans at, again, the Mecca of basketball. Seats appeared only half-full at the start of the game and even though the crowd filled in as the night went on, the cheers for the 76ers also seemed to get louder. Philadelphia is close by so sure, their fans can travel easily. But it started to feel like the 76ers were the home team by the end of it and there was even a loud ‘Trust the Process’ chant in the fourth quarter when Joel Embiid was at the free throw line. I’m inclined to be sympathetic of Knicks fans in this case and MSG was so cool otherwise that it didn’t take away from the experience. Even though I’ve not attended a game in every city, I feel comfortable saying that MSG should be near the top of the list as a destination to watch basketball for any fan. Joel Embiid finishes at the rim in the win against the Knicks. 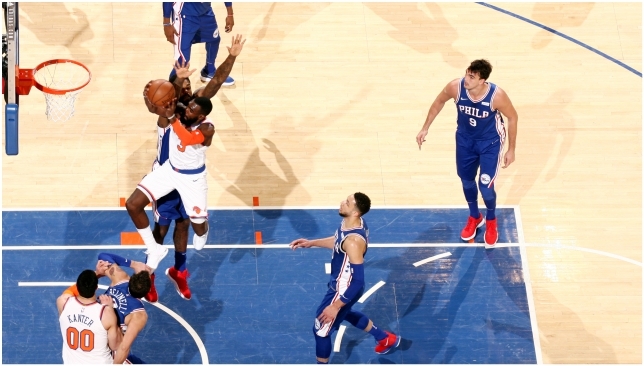 A late surge spearheaded by Joel Embiid helped the Philadelphia 76ers fight back for a 118-110 win over the New York Knicks on Thursday. 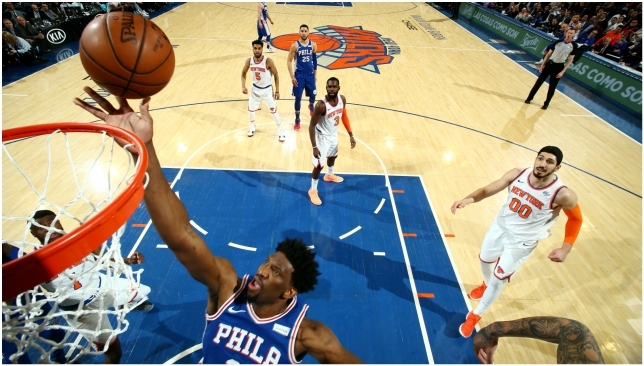 Embiid treated the Madison Square Garden faithful to an all-around performance by posting a double-double with 29 points and 10 rebounds, paving the way for a road victory as the 76ers jockey for position in the Eastern Conference playoff race. Here, we analyse the Philadelphia centre, who turns 24 on Friday. There are very few players in the NBA that possess the mix of size and skill that Embiid does. The 76ers big man is truly one of the league’s ‘unicorns’ and his impact on the game is practically constant every second he plays. The first thing that’s obvious when seeing Embiid live and in-person is his size. Listed at 7-foot-0, 250 pounds, Embiid is every bit that as an imposing figure that dwarfs over his peers. That size becomes even more breath-taking when he shows off his technical ability, which allows him to do nearly everything on a basketball court. Embiid is the engine that powers Philadelphia’s offence and many of their sets begin and end with him receiving the ball at the top of the arc or at the elbows. He has the ability to post-up, roll to the rim or pop for a jumper after setting a screen, attack closeouts and create his own shot in one-on-one isolation situations at the elbow. On the other end of the floor, he’s a wall in on-ball situations and when he rotates quick enough, is a lethal help defender. Attacking closeouts – Embiid din’t settle for many contested 3-pointers and instead did well to pump and head fake to get defenders leaning the wrong way, before zooming past them for easy driving lanes. Rim protection – Both of Embiid’s blocks were highlight worthy, especially the second one in which he stared down Trey Burke after. It’s part of the reason why he might pick up Defensive Player of the Year. Posting up – It just wasn’t Embiid’s night in the post as several of his possessions there ended with low-percentage shots or turnovers. Philadelphia went away from that in the second half as Embiid faced up more. Ball movement – This is nitpicking, but there were times when Embiid caught the ball and it kind of stuck to him. He’s a great passer for his position so this is just holding him to a high standard, which he can meet. First quarter, 7:49, LAYUP: Embiid receives a pass above the 3-point line and pump fakes to get the closing out defender off his feet, drives and finishes at the rim. First quarter, 6:17, 3-POINTER: As the 76ers sling the ball around, Embiid finds himself alone on the perimeter and slides into the corner, where he receives a pass from a driving Ben Simmons and splashes a triple. Second quarter, 11:11, BLOCK: Embiid finds himself covering Trey Burke on a switch but after getting beaten by the guard’s quickness, he recovers as a help defender to block Kyle O’Quinn’s point-blank shot to force a jump ball, which he wins. Second quarter, 7:59, ASSIST: After catching the pass at the elbow, Embiid pivots around and flashes his playmaking by delivering a pinpoint backdoor pass to a cutting Marco Belinelli for a layup. Second quarter, 7:29, TURNOVER: Embiid sets up in the low block, but after being fed the ball, he has it knocked away and then throws a wild, errant pass into the backcourt to give possession to the 76ers. Fourth quarter, 11:50, DUNK: Philadelphia run a beautiful play on their first possession of the quarter, which sees Embiid passing from the top of the arc and using a back screen to catch a lob for an and-one. Fourth quarter, 2:26, BLOCK: Embiid gets switched onto Emmanuel Mudiay, who backs out and tries to attack the mismatch, only for the 76ers centre to meet him at the rim and block the layup, resulting in a fast-break 3-pointer for J.J. Redick. This type of performance is why Embiid was an All-Star and developing into one of the game’s brightest stars. He can do a little bit of everything and when he’s clicking, the rest of his team-mates feed off his energy. The crazy thing is, he still has room to grow and years to sharpen his offensive arsenal, which is getting more and more extensive. Defensively, his presence can’t be understated.